Winter squash is now in season!!! I went to a local supermarket and the squash was on sale for 89 cents per pound! I had to get one. 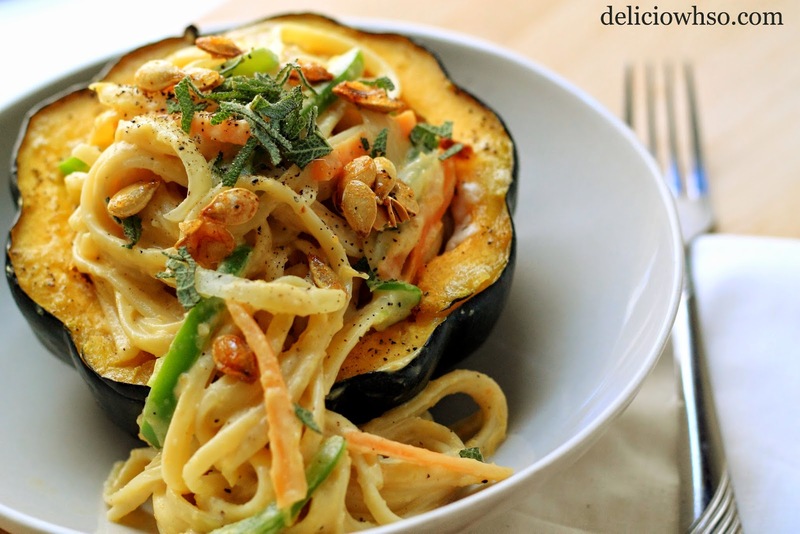 I wanted to try something more unique than simple roasted squash or soup, so I created a pasta with colorful vegetables that is served in the roasted squash! This recipe isn't the simplest of recipes, but it is extremely delicious! The long list of ingredients is not as long as it looks- because you have to season every step of the way, and because you use all of the parts of the squash. Try this recipe today and surprise your guests! 2. Cut the acorn squash in half, horizontally. If there's a stem, cut off the stem as well. Be extremely careful when cutting because the squash is difficult to cut. If you aren't careful, the knife will slip. If the melon will not stand straight, cut off a portion of the bottom so it will stand without rolling around. 3. Pull out the insides of the squash. Save every part! Place the seeds into one bowl, and the insides of the squash into another. 4. Use a melon baller to remove the insides of the squash. Do this all around the cavity until there is about a 3/4" border all the way around. Place that into the bowl with the insides. 5. Place squash halves, face up, onto a sheet pan. 6. Season with salt, pepper, and garlic powder. 7. Cut butter into 1/2" cubes. Place on the edges of the squash and the inside. 8. Bake for about 40 minutes, until tender. 3. Place small chunks of butter over the seeds. 4. Toast until slightly golden. 5. Add brown sugar and allow put back into toaster oven until sugar completely melts and begins to bubble. 6. Remove and allow to cool. 7. Break the up the seeds with your hands. 1. Boil water and salt for the pasta. 2. When boiling, add pasta and cook until al dente. 3. Julienne (cut into thin strips) the vegetables and set aside while you wait for the pasta to cook. 3. Pour the cooked pasta into a strainer and rinse with cold water to stop the cooking. 4. Heat pot that you cooked the pasta in on high heat. Add butter, garlic, sage, and insides of squash. 5. Allow to sear slightly. Add seasoning. 6. Reduce heat to low-medium. Allow squash to soften. 7. Add water. Simmer the squash, and use a fork to smash it as it softens more. 8. Add cream, salt, pepper, and garlic powder. 9. Allow to simmer. Add lemon juice. 10. Allow to simmer until it thickens slightly. 11. Remove from heat, and use an immersion blender to ensure that the squash and cream are completely emulsified. If you do not have an immersion blender, you can use a food processor, but be careful not to overfill it. 12. In a saute pan, heat oil. 13. Once hot, add vegetables and saute until cooked. The onions will be translucent at that point. 14. Add the vegetables to the sauce. Then, add the pasta and mix until well incorporated. 15. 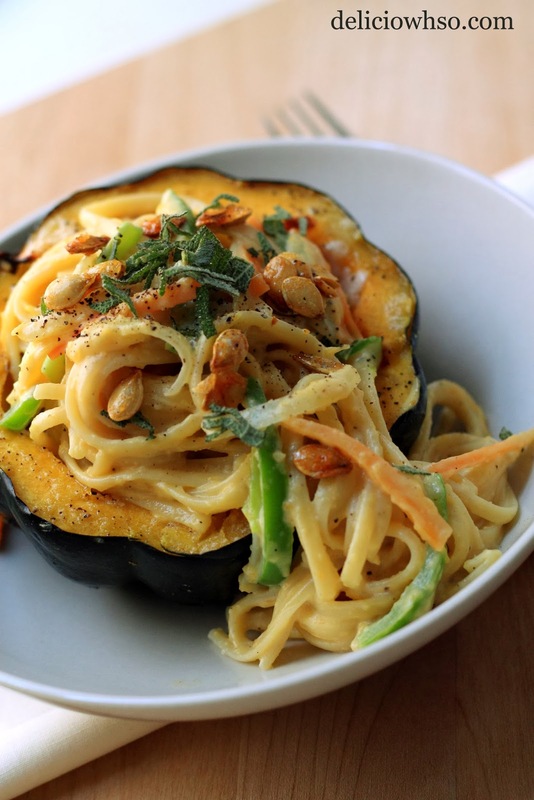 Place the pasta into the roasted acorn squash bowl. 16. Garnish with freshly cracked pepper, chopped sage, and toasted squash seeds. If you want to make more, just multiply the recipe for however many guests you plan to feed! I made this for my lovely roommate, Betsy, and it was delicious! If you want to add protein, I recommend adding chicken tenderloin. You can season and cook the chicken in the saute pan before adding the vegetables. Add the vegetables when the chicken is 3/4 cooked. The tender chicken would offset the crunchy seeds to create a myriad of textures and flavors. Though the recipe for this pasta is lengthy, it is not extremely difficult to make! As long as you stay organized and clean, it is easy to do! Try this unique pasta at home and share with your closest friends!